Listed early 20thc Stone Country House constructed with quality and expertise which today keeps its originality. 170m² Beautiful entrance hall opening onto a 44m² bright living area. 12m² independent and charming kitchen which leads out to the garden. Plus a 13m² south facing room which could be used as an office/bedroom. Original hardwood staircase leading up to the 1st floor with four bedrooms, 12 to 18m² and bathroom. A 60m² attic suitable for further accommodation. 37m² annexe : 1500m² ornamental garden with mature trees. 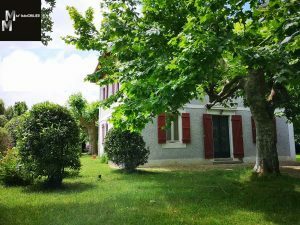 A truly delightful domaine in need of a period update!!! Possibility of dividing this property into two with a rental value of €20 000 per annum.